A ceramic folder knife with a titanium handle? That's some fancy materials there, sir. Is it worth the hype? Ceramic, as you may know, presents a unique trade-off. Ceramic blades are lightweight, hold their edge for darn near forever and are extremely sharp. The downsides? Ceramic blades can chip or break under extreme tension, and they should be professionally resharpened. If you're okay with the downsides, this might be a good choice for you. 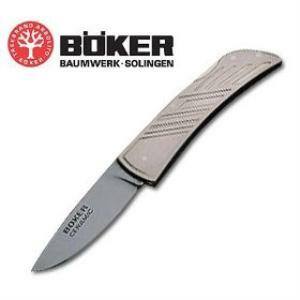 Certainly Boker is a brand you can trust. Based in Solingen, Germany -- aka "Blade City" -- they've produced high-quality knives for, I don't know.... forever? This blade is slim and lightweight, as you'd expect of one made from these materials. The handle is ultra-strong titanium or a more-comfortable but somewhat chunkier textured Zytel. The titanium version is also available with a blue-tint.